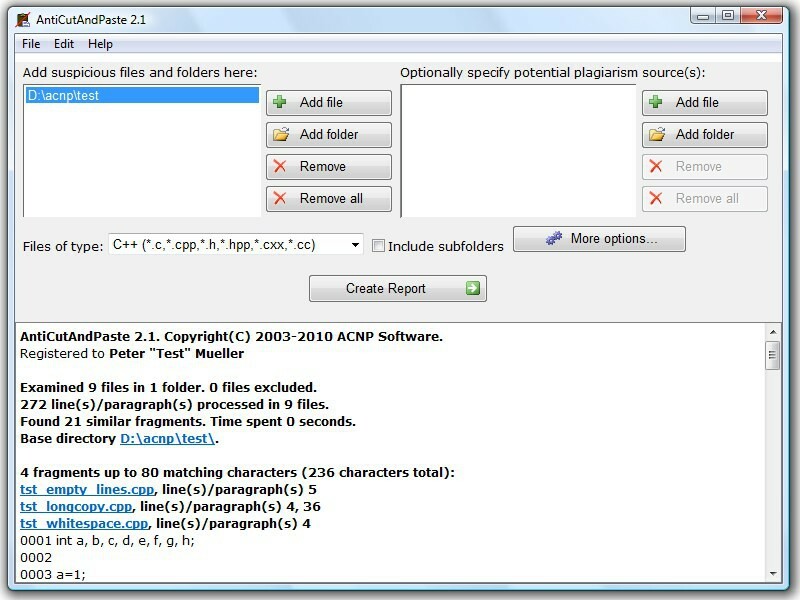 AntiCutAndPaste is designed to search for text fragments that have been copied and pasted in programming language source code or plain text. AntiCutAndPaste is tested on sources from large C++, Pascal, Java, and C# (Mono) projects. Algorithms used are very fast and can handle up to three million C++ code lines in one minute. Minor modifications of code are ignored during the search. GUI and command line versions are included. Reports are sorted conveniently by the total size of all similar fragments and there are many report customization options. Linux command-line implementation is still a Beta version. Please be so kind and visit forums to ask a question or to write a comment. Compatible with C++, Pascal, Java, C# (Mono) and plain text. Small download, prebuild static x86 binary. Very fast native x86 code. 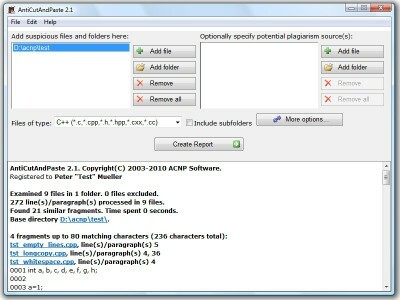 Processes about 50,000 lines of C++ sources in one second on Pentium 1.0 MHz computer. Convenient report sorted by total size of all cloned code places. Lots of report customization options available. Free for non-commersial use (Linux version only). New file filters were added.